Minecraft has turned out to be a spectacularly success and a fascinating counter-argument to the UX scolds who insist that users are always right and that meeting user expectations is always the right thing to do. Suppose you’re playing Minecraft and you want to want some light. Without light, you know, you might be eaten by a grue or something. You can’t see what you’re doing, and what fun is that? So you need a torch. 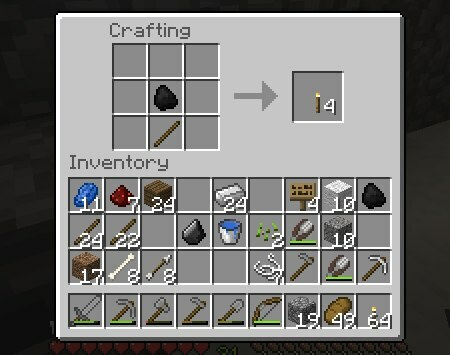 To make a torch, you arrange a wooden stick and a piece of coal on a “crafting table.” What could be more natural? Well, anything would, since no one ever made a torch from a lump of coal. And this esoteric formula isn’t explained in the manual, because there’s no manual. You figure it out for yourself, or you guess, or you look it up in the Minecraft wiki. It goes on like this. How do you make a bed? Easy! You arrange three blocks of wool and three wooden planks on a “crafting table”, and you’re done. Isn’t that the obvious way to construct a bed? How else would you make a bed? Want to eat some fish? Better make a fishing rod! You do this with sticks (same as for torches) and string (which you get by hitting giant spiders.) Go figure. So, we have an opaque user interface that relies entirely on hidden, esoteric knowledge. Check. We have clever but unspectacular graphics. Check. We have no plot. Check. We violate every rule in the book. And what do we get? Lots of fun, it turns out, and reportedly lots of sales with very limited marketing.